Check out a Documentary Bucket to host your Precious Knowledge House Party! Friday, October 12th is a National Day to support the Ethnic Studies Battle. All across the country Precious Knowledge screenings are going to be held in family rooms, community centers, and schools to raise awareness and funds. 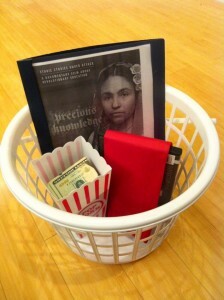 We are launching a TAG Boston documentary lending library and you can check out a Precious Knowledge screening bucket! 3. a popcorn inspired cup for raising money that day. Make a donation here. 4. a complimentary couple bags of popcorn! 5. www.tagboston.org materials to copy/handoutIf you are interested in hosting a Precious Knowledge screening, there are 5 buckets available to be checked out. Contact: mehtasw@gmail.com (Swati Mehta) for more details.